Regular schedule of after-school rehearsals begins, 3:15-4:45, Mondays, Tuesdays, Thursdays, and Fridays on non-game days. The road behind the football stadium will be open tomorrow, so we can park in our usual place in front of MJHS. Please drive slowly across the gravel and dirt in the construction area. See you tomorrow! Hello Band! I'm looking forward to seeing everyone tomorrow (Monday) morning at 8:00 am for our first day of band camp. I'm starting something new this year, and it's called "band families." I'll explain tomorrow morning, but for now, please remember your family number listed below to the right of your name. See you bright and early! A general schedule for 2010-2011 has been posted to the files section of Yahoo Groups and will arrive on the website soon. Mr. Godfrey will be at the band room on Wednesday, July 21 at 1:00 to measure students who need band shoes. When shoes arrive, a check or cash in the amount of $30.00 is payable to the Moody Band Boosters. If you need shoes, be sure to try the surplus in the uniform room before ordering a new pair. You might save yourself an expense. Here is a detailed schedule for Band Camp. This form will also be added to the Form section of this site. I added a new audio section to the website. I will be adding any relevant audio tracks to that section. Here are the most recent audio tracks. It is hard to believe that the 2010-2011 school year and football season is just around the corner. Last year our football and band programs both had very successful years. We are excited and are already anticipating the growth and success of all of our students associated with Moody Schools for the coming year! 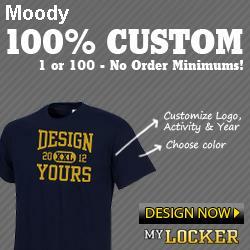 We are also eager to introduce the new exciting look of the Moody High School Football Program. This year the program book will have a new feel and will also be in full color including all ads. This will be an opportunity for parents, family, and friends to encourage their students; businesses and organizations to get their name in front of many people, support our school, and invest into our students; and the new color program will be a wonderful souvenir keepsake. We would like to take this time to invite you to sponsor an advertisement in the NEW Moody High School Football Program. We have enclosed a form that can be copied to use as an invoice with all information needed. We can also provide a receipt to you that may be used as a business deduction. Please include all pictures, logos and sketches (work sheet provided) of ads with completed form before Friday, August 6, 2010. The graphic artist has final design approval on all ads. Camera ready ads can be submitted via disk in Adobe, InDesign, or Illustrator. We would like to thank you for investing into the lives of students! If you have any questions, need more information, or need to have an ad picked up in person, please contact me at (205) 541-0525 or at radkins@missionbirmingham.org. The following students need to fill out and submit forms titled "Band Student's Medical Release." These forms were provided when we had our big "Invest in the Blue" meeting in the spring and have been in the band room since. You may pick them up this Thursday evening at 6:00 practice, complete them, and turn them in before you leave. If we don't get these and other forms by Monday, we will not be able to have marching rehearsals next week! I know it's a pain to fill these out, but please get them in. I look forward to seeing you! The following students must have a physical before participating in band camp. Please take care of this by summer band rehearsal this Thursday to avoid being benched at camp next week. I will double check the availibility of forms on the web and on Yahoo Groups. Forms also are available in the band room. Please call before you come to be sure the band room is open: 640-1995. We will board the bus at 7:30 am and return to the Moody band room around 1:00 pm. See you this Thursday at summer band! I need band t-shirt sizes from everyone. If your name appears below, please respond to brad.sargent@sccboe.org (do not reply to Yahoo Groups) with "Band T-Shirt" in the subject line. State your name and the size you would like to order. I must place our order this week, so your prompt response is appreciated. Have a great day, and I look forward to seeing you at our summer band rehearsal this Thursday, 7/12! On Saturday, July 24, band officers will attend a workshop presented by leadership expert Dr. Tim Lautzenheiser at Homewood High School. We'll travel by bus from the Moody band room at 7:30 am, and the workshop will last until about 1:00 pm. The band boosters have already paid for your attendance at this event, so if you anticipate a conflict with attendance, please let me know by this Monday, 7/12 so I can find a replacement for you. Call the band room at 640-1995 or e-mail me at brad.sargent@sccboe.org. I know we're going to enjoy this workshop, and I look forward to spending that day with you! Officers are listed below.